Arrive in style and meet your personal chauffeur, who will whisk you away to your hotel aboard a limousine. A full day tour blending local life style and must-see attractions. Your personal tour guide will meet you at the hotel and will let you explore Bangkok aboard your private minivan and using local transportation like a real Bangkoker ! Visit Bang Rak market where is it possible to see the local Thai way of life and world-famous street food. Take an Express boat, the main public transportation on Chao Phraya River and see important landmarks from the “River of Kings”. Walk to Yaowarat Road, the heart of one the most authentic China Towns lined with golden shops, herbalists, food stalls and restaurants. A short drive leads to Pakklong Talad, the largest fresh flower market in Bangkok opened around the clock. Take another Express Boat to reach the royal area. Lunch at a local restaurant. 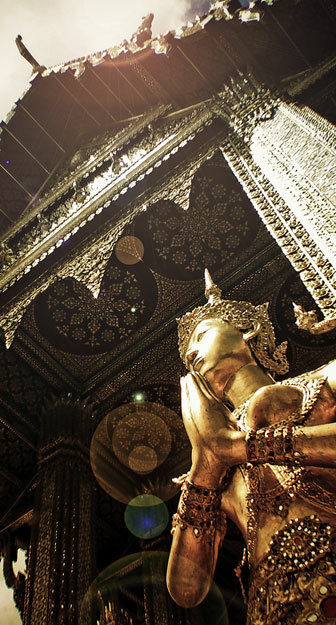 Visit Royal Palace and Wat Pra Keaw, the most revered temple in Thailand housing the Emerald Buddha statue. The last visit is at Wat Pho, the temple of the Reclining Buddha, the oldest and largest temple in Bangkok. Before driving back to your hotel, sit in a nice café on the river opposite the striking temple of Wat Arun and sip a refreshing drink. Discover the contrast of the City of Angels with a stylish dinner cruise in a lovingly restored antique rice barge while savouring Thailand’s world renowned cuisine. While cruising on the river admire some of the landmarks of the city from the imposing Wat Arun (the Temple of Dawn), Grand Palace, historical bridges, glittering temples, imposing colonial buildings…. Full-day excursion with your private guide to Ayuthaya, capital of the Kingdom of Siam from 1350 to 1767 when it was looted and burnt down by the Burmese army. Before that, by 1700, Ayuthaya had become the largest city in the world and it still possible to see some of the grandeur of palaces and temples. The ruins of the historic city became an UNESCO World Heritage Site in 1991. Wat Mahathat temple, built in 1374, has a Khmer style and it is famous for the Buddha head trapped in tree roots; Wat Na Phra Mane is unique because it survived the destruction being the headquarter of the Burmese army; Wat Lokayasutharam has a mysterious past and enshrines a large Reclining Buddha. Lunch at a local restaurant. At the end of this unforgettable experience, your chauffeur will transfer you to your flight aboard your limousine.